Escape from the city vibe to experience a peaceful atmosphere, on our road bike tour from Bangkok to Ayutthaya. On this 75-km smooth ride on back roads. You can witness the distinctive transformation of lives and communities along the way between the present and the former capital cities of the Thai Kingdom. With no fuss and little busy traffic, it's time to take in the beauty of the scenery as you cycle to the past and history comes to life. Once you arrive at the destination, you will find it's hard to believe you have cycled from the modern world back in time over 400 years in one day. With our hotel pick-up service, the ride begins on the outskirts of Bangkok, then heads north along canals ('Klongs' as they are called in Thai) where local communities lie on both sides. As you bike your way through endless paddy fields, you will find yourself in the middle of small villages where people live their simple lives; riding the motorcycles to an old fashion grocery store, buying street food from a cart-vendor, or chit-chatting on a big bench under a huge tree on the side of the road. Say hi to those little kids who are likely to wave back at you in excitement plus that signature Thai-style big smile. Enjoy the charm of those temples you will never find in any guide book. Before you know it, you will arrive at Wat Chaiwattanaram, a landmark in the UNESCO World Heritage site of Ayutthaya. Enjoy our refreshments on the way and take a nice lunch break by the river. Have fun with your ride and return to Bangkok safely in our comfortable air-conditioned van. During your cycle we will not stop at any sites unless by request. The focus of this tour is to accomplish riding 75 kms by the end of the day. If you are more interested in seeing temples, then please look into our Historic Ayutthaya tour. The guide and van driver were both very friendly and helpful, the route was good, the bikes were good for the ride type, and the weather was great! The food and drinks provided were also of a high standard, and appreciated. Our tour guide was exceptional. We rode for miles through incredible sites and experienced a new side of Thailand. What a great day with a great guide! 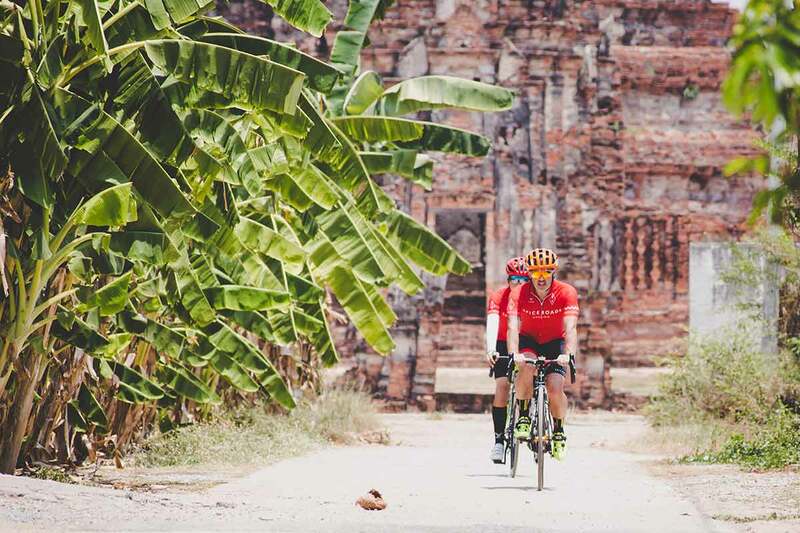 Cycling at a fast clip through idyllic countryside, stopping for rest and food at quiet riverside spots, and the amazing history and architecture of Ayutthaya. One of my best days in Bangkok! Escape from the city vibe to experience a peaceful atmosphere, on our road bike tour from Bangkok to Ayutthaya. On this 75-km smooth ride on back roads you can witness the distinctive transformation of lives and communities between the present and the former capital cities of the Thai Kingdom. With no fuss and little busy traffic, it's time to take in the beauty of the scenery as you cycle to the past and history comes to life. Once you arrive at the destination, you will find it's hard to believe you have cycled from the modern world back in time over 400 years in one day. With our hotel pick-up service, the ride begins on the outskirts of Bangkok, then heads north along canals ('Klongs' in Thai) where local communities lie on both sides. As you bike your way through endless paddy fields, you will find yourself in the middle of small villages where people live their simple lives; riding the motorcycles to an old fashion grocery store, buying street food from a cart-vendor, or chit-chatting on a big bench under a huge tree on the side of the road. Say hi to those little kids who are likely to wave back at you in excitement plus that signature Thai-style big smile. Enjoy the charm of those temples you will never find in any guide book. Before you know it, you will arrive at Wat Chaiwattanaram, a landmark in the UNESCO World Heritage site of Ayutthaya. Enjoy our refreshments on the way and take a nice lunch break by the river. Have fun with your ride and return to Bangkok safely around 5 pm in our comfortable air-conditioned van.